It’s been on or off for the Heat in these NBA finals and to start the pivotal Game 6 in Miami Tuesday night, the Heat were off. Miami had been off in Games 1, 3, and 5 and lost each of them—the latter two by double-digits. But Game 6 was different. Down 3–2 in the series the Heat had to win or go home with the knowledge that they blew a prime chance to become champions again. And Miami coach Erik Spoelstra would go home knowing he’d lost to Spurs Gregg Popovich in the battle of the coaches. Now just because one team wins and another loses doesn’t always mean that the coaching was the difference. But this is a 66-win Miami squad with three All-Stars (including a certain four-time MVP) in the prime of their careers against a 58-win San Antonio squad, which boasts three stars (one is a valuable sixth-man) though two are pushing retirement. Clearly Spoelstra has a little more talent to work with than does Popovich. Besides, the Heat has the home court advantage. Regardless, through three quarters the Spurs were well in command with a 10-point lead, needing only to hang on for 12 more minutes to clinch another title. The Heat came out at the end of the third-quarter break a new team. All of a sudden they were swarming on defense and the offense was clicking. Halfway through the quarter they had already taken the lead. And after a thrilling end of regulation and then overtime, the Heat prevailed. But what happened that caused the sudden change in the Heat’s disposition? The same team that for three quarters was sputtering on offense and a step slow on defense, while arguing every call (or non-call) with the referees, was suddenly on. Although there’s certainly no proof of how a team suddenly changes course during a game, it’s generally accepted that a good coach can push the right buttons to make it happen. That’s where Erik Spoelstra comes into play. Spoelstra, despite winning three straight Eastern Conference titles with the Heat, is still a relative unknown in the coaching ranks—how good is he really? Is it just the talent of LeBron James, Dwyane Wade, and Chris Bosh that decided to descend on South Beach three summers ago that is the main key? Or does Spoelstra do much more than just insert LeBron and tell the team to give him the ball? Probably a combination of the two, but Spoelstra, who had just two seasons under his belt (both were first round playoff losses) when the trio arrived, showed his worth in Game 6. An inside look at the team’s huddle at the beginning of the fourth quarter caught Spoelstra telling his team that this was their best defensive quarter of the playoffs. Somehow, someway during his quick speech he had managed to get the team to forget the past three quarters, as well as the inherent pressure of being the favorite trying to repeat as champions, and just play the way they had all year. It’s not easy to step out from behind a star like LeBron James—just ask Phil Jackson who needed title after title with Chicago (six in all) to step out of Jordan’s shadow. 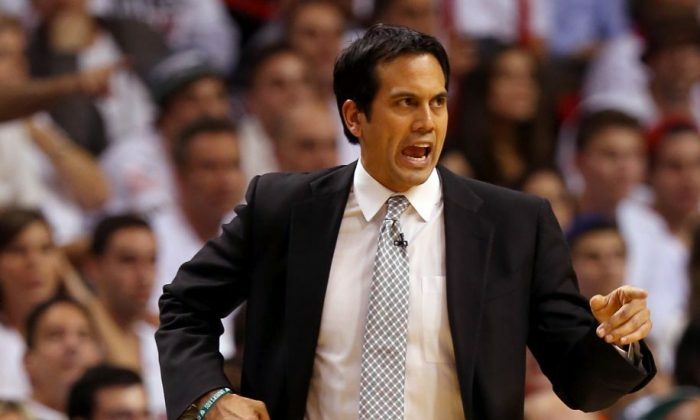 Erik Spoelstra may not ever be Phil Jackson, but he can stand on his own.